Images of the attack handed out by the Israeli military. ISRAEL’S MILITARY ADMITTED for the first time that it was responsible for a 2007 air raid against a suspected Syrian nuclear reactor, a strike it was long believed to have carried out. US President Donald Trump, who met Netanyahu at the White House this month, has said that the nuclear deal must be “fixed” by 12 May or the United States will walk away. An Israeli military spokesman declined to respond to questions related to the admission and the release of the documents, including over the timing, which could be seen as a warning regarding Iran’s activities. 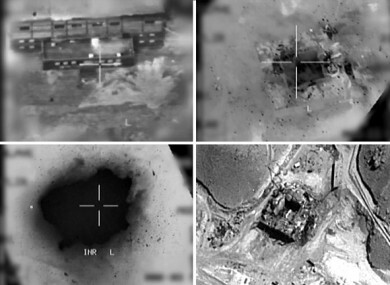 “On the night between 5-6 September, 2007, Israeli Air Force fighter jets successfully struck and destroyed a Syrian nuclear reactor in development,” the Israeli statement says. The reactor was close to being completed. The operation successfully removed an emerging existential threat to Israel and to the entire region — Syrian nuclear capabilities. Israel’s admission is by no means the first time its military has been identified as the source of the attack. In 2008, less than a year after the strike, US officials accused Syria of having sought to build a secret nuclear reactor and acknowledged Israel destroyed it in the raid. The UN atomic watchdog declared in 2011 that the Syrian site was “very likely” to have been a nuclear reactor, adding that information provided to it suggested that it was being built with North Korean assistance. “The nuclear reactor being held by Assad would have had severe strategic implications on the entire Middle East as well as Israel and Syria,” it said. While Israel’s admission will come as little surprise, the declassified material provides new details on what is widely known as Operation Orchard. The material speaks of an ultra-secretive operation, with very few knowing details of the strike and a cover story provided. Israeli intelligence had picked up on what it determined was the construction of the nuclear reactor and followed its development, it says. Four F-16s and four F-15s were involved in the strike, with the operation beginning at 10:30 pm on September 5 and the planes returning at 2:30 am the following day. Grainy footage of the strike included in the material shows a target locking on to a building that is blown apart shortly afterward. Israeli military chief of staff Lieutenant General Gadi Eisenkot, who was northern commander at the time, recalled in a video in the material meeting with his officers shortly before the raid. “I don’t give them the exact details of the target and its essence, but I say that there’s going to be a significant attack in the upcoming 24-48 hours, an event that in low likeliness could lead to war,” he said. Syria and Israel have fought in repeated wars since the Jewish state’s founding in 1948. The two countries are still technically at war. Israel has sought to avoid direct involvement in the Syrian civil war that broke out in 2011, but it acknowledges carrying out dozens of air strikes there to stop what it says are advanced arms deliveries to Lebanese Shiite group Hezbollah. Hezbollah is fighting alongside Assad’s regime, like Iran and Russia. Israel has expressed growing concern over what it sees as Iran’s attempts to entrench itself militarily in Syria. It also accuses Iran of seeking to build factories to construct precision-guided missiles in Syria and Lebanon that could be used against Israel. Eisenkot spoke of the “message” of the 2007 strike, while making reference to a 1981 Israeli raid against a nuclear reactor in Iraq. “The message from the 2007 reactor attack was that Israel won’t accept the construction of abilities that could constitute an existential threat to the state of Israel,” he said in the video. Email “Israel releases video of air strike against Syrian nuclear reactor”. Feedback on “Israel releases video of air strike against Syrian nuclear reactor”.